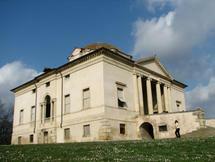 Vincenzo Scamozzi (September 2nd 1552 – August 7th 1616) was a Venetian architect and a writer on architecture. 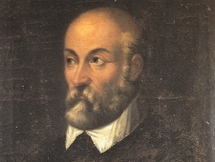 He was perhaps the most important figure between Andrea Palladio, whose unfinished projects he inherited at Palladio's death in 1580, and Baldassarre Longhena, Scamozzi's only pupil. Scamozzi was born in Vicenza. His father was the surveyor and building contractor Gian Domenico Scamozzi; he was Scamozzi's first teacher, imbuing him with the principles of Sebastiano Serlio, laid out in Serlio's book. Vincenzo visited Rome in 1579-1580, and then moved to Venice in 1581, where he had been invited to design the Procuratie Nuove on the Piazza San Marco. In 1600 he visited France and left a sketchbook record of his impressions of French architecture, rediscovered only in 1959. Scamozzi's influence spread far beyond his Italian commissions through his treatise, L’Idea dell’Architettura Universale ("The Idea of Universal Architecture"), which is the last of the Renaissance works on the theory of architecture. It was published with woodcut illustrations at Venice in 1615. Scamozzi depended for sections of his treatment of Vitruvius on Daniele Barbaro's commentary, published in 1556 with illustrations by Palladio.